Organic brown rice, organic rice bran extract, tocopherols (Vitamin E), alpha-amylase (enzyme) and electrolytic iron. That was my daughter’s foray into the world of solids. Rice cereal. That makes me so sad. After a few days of tightly closed, pursed lips, I tasted the cereal myself. While Surya was watching me. Alert: novice error. I had to feign an “mmmmm delicious” face. It was awful. So I decided to fast forward to pureed sweet potatoes. Sadly, those haven’t been much more well received, but I’m chalking the lack of enthusiasm up to her getting used to a spoon and a new texture. And to the idea of food! While Surya was noshing on her pureed sweet potatos, we had some sweet potatos of our own. Ours had just a few more bells and whistles. Cracked red chillies and soft nuggets of garlic hidden within the natural sweetness of the potatoes. If only Surya could have had a little nibble from our sweet potatoes. There would have been no spoon confusion. I’m pretty sure she would have been opening wide for a second bite. I was thinking about cooking with sweet potatoes, but hesitated because I’m not a huge sweets person. The natural sweetness seemed to be begging for a pairing with spicy heat. When my brother suggested cooking them in chili oil with some garlic, I was a little skeptical about how garlic would pair with the sweetness But the savory, garlicky nuggets went perfectly with the almost caramelized tasting sweet potatoes. I usually just add dried red chillies whole to dishes, but I broke them up here so they could properly challenge the sweetness of the sweet potatoes. Breaking the chillies releases more of the heat b/c the seeds get released. 1. Preheat the oven to 350 degrees. Poke a few holes in the sweet potatoes to prevent them from exploding in the oven. Place on a cookie tray and bake for about 1 hour. They should be tender but not mushy. Remove from the oven and allow to cool until you can handle them. Slit them in half and use a spoon to scoop the insides out into a small bowl. Lightly mash them with the back of a spoon. I left a few pieces chunky for texture. 2. Heat a splash of olive oil in a large skillet on medium heat. Add the onions and saute for about 5-8 minutes. Add the garlic and continue cooking until the onions are glassy and the garlic is soft but not browned. 3. Add the red chillies and continue cooking for another 3-4 minutes. 4. Add in the sweet potatoes and mix well. 5. Sprinkle with the chat masala and salt to taste. I used about one and a half teaspoons of salt. Chat masala gives a tangy, tart taste to the sweet potatoes. If you don’t have it in your spice cabinet, try a teaspoon or so of lemon juice. I’m a sweet potato lover. I would love this. Looks delicious!! Sweet and spicy -yumm!! Your sweet potatoes looks yummy. I was thinking it would go well with some methi paratha. My guy didn’t like solids until about 11 months. He’d close his mouth to a spoon except when big sister would play-feed him with an empty one! But he’d sit in his highchair and scrape his little teeth on a whole peeled apple, or chew on a scallion. @Stephanie – I agree! I’ve decided I need to step it up on the taste factor for her. While I want her to taste the naked vegetable itself, I can’t help but wonder if she thinks it’s bland! We just got the go ahead to add some flavor and spice since her 6 month birthday was yesterday. Also, in the last few days, she’s been opening up for the spoon. I think she actually likes the rice cereal over the pureed mangos we gave her, so who knows – maybe she’ll have a savory palate. Works for me! Looks yum.. new to me.. 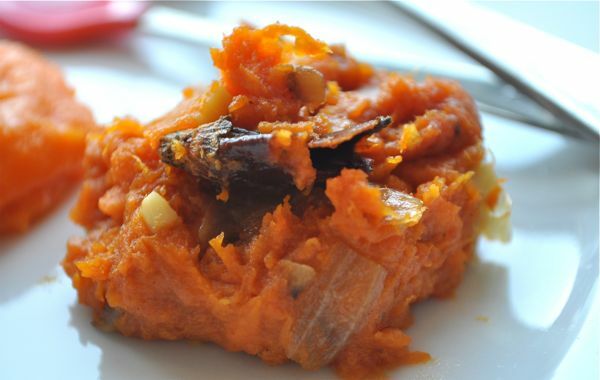 I love sweet potatoes..this is fantastic recipe! This looks incredible. Nice use of chaat masala.